Backup for Workgroups has an add-on that you can use to restore individual Exchange email messages without interrupting or altering your Exchange Server. 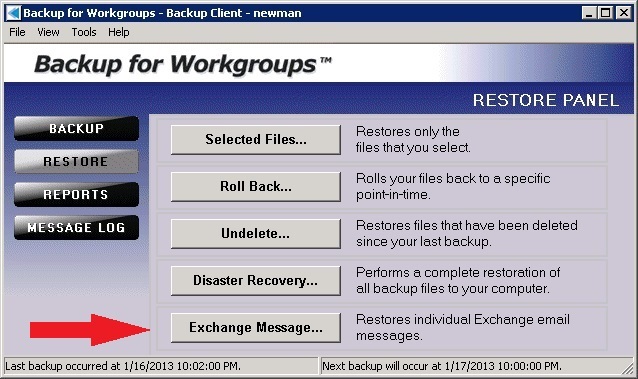 Backup for Workgroups (BFW) backs up the message stores from your Exchange Server. The backup copy of your Exchange Message Store can be restored in its entirety if you have a disaster or you can use the Exchange Message Restore (EMR) add-on to restore selected messages from the backup copy. With the Exchange Message Restore Add-on activated in BFW 7.0 or higher, you can view backed up mailboxes, folders and messages and you can restore individual email messages while your Exchange Server runs normally, without any interruption. In other words, you do not need to take your Exchange Server down, or alter the Exchange Server in any way to restore individually selected email messages. What is Brick Level Backup and Brick Level Restore ? The term "Brick Level" - means that you are performing a task at the mailbox or email message level; not at the Exchange Mailbox Store level. Some backup programs offer brick level backup, which means the backup program only backs up the email messages. Brick Level backup is usually significantly slower than complete mailbox store backup. Brick level backup is an incomplete backup solution because your Exchange Server stores more than just email messages, such as calendar information which is skipped with brick level backup. As a result, backup programs offering brick level backup need to perform complete mailbox store backup also, which in effect causes duplicate backups. Backup for Workgroups performs complete backups of the Exchange mailbox stores, while offering brick level restore capabilities. Brick Level Restore - means that you can restore email messages within a mailbox without having to restore all the mailboxes and you do not need to restore the entire Exchange mailbox store. 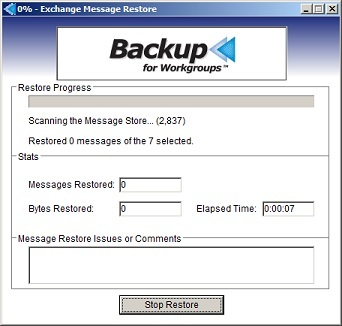 Backup for Workgroups offers Brick Level Restore with the Exchange Message Restore add-on. Backup the current Exchange mailbox stores in their entirety. Stop the Exchange Services - stop all services associated with Exchange. Delete or Move all mailbox stores and their log files. 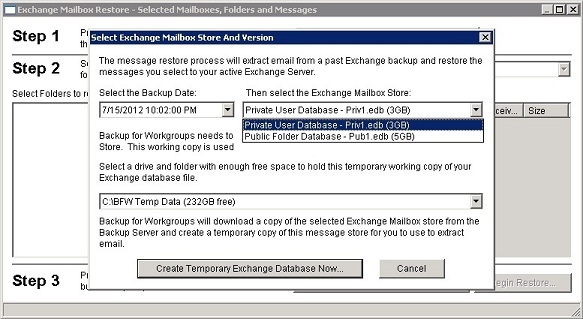 Run a restore of the Exchange mailbox stores and select a date in the past when the messages you want to restore existed (before they were deleted). Disconnect the Exchange Server from the Internet to prevent processing email while you have the old mailbox stores in use. Start the Exchange Services and use an Outlook client to extract the email from Exchange to a PST file. Stop the Exchange Services again. Delete the restored Exchange mailbox stores. Restore the most current Exchange mailbox stores from step 1. Reconnect the Exchange Server to the Internet. Go to an Outlook client and import the extracted email messages. As you can see the traditional route to restore an email message is very time consuming and has significant risk associated with it. Go to the Exchange Server, run Backup for Workgroups, go to Restore -> Exchange Message Restore. Select the date in the past when the email existing and Backup for Workgroups will pull a copy of that version of the Exchange mailbox store from the Backup Server and create a temporary mailbox store in a temp folder so that the production mailbox store is not altered. Select the Exchange mailbox / the email user account that held the email. Backup for Workgroups displays the folder view of that users account in a view similar to Outlook. Select the email messages you want to restore, this can be individual messages and folders of email messages. Specify the email server and the email address to send send the restored email to. The restored email message will be sent to the inbox of the specified recipient. Note that when you use the Backup for Workgroups Exchange Message Restore add-on, the production Exchange Server is never interrupted nor modified. Also the entire time for the restore is minutes instead of hours or days as with the traditional route. You will need a VERSION 7 Backup for Workgroups Client with the Backup for Workgroups Open File add-on installed on your Exchange Server. You will also need the Exchange Mailbox Restore Add-on license. Once you have installed a Version 7 Backup Client license and a license for the EMR Addon, you can restore messages from your Exchange Server backup data. And yes, if you have been performing backups of your Exchange Server and need to restore messages from the past, you can purchase the EMR license and it will be able to restore messages that were backed up before the license was purchased/activated. Now, go to your Exchange Server computer. At your Exchange Server, run Backup for Workgroups. When you have the EMR Addon license, the Restore panel on the Backup Client for your Exchange Server is fully operational. Notice that this button is present when using BFW in evaluation/trial mode, but you can only restore messages once you have purchased an EMR license. On the Restore panel, press the “Exchange Message” button. If you do not see the Exchange Message button, then you are running an older version of Backup for Workgroups. You will need to both upgrade your Backup Server and Backup Client running on your Exchange Server to version 7.0 or higher and you will need to purchase an Exchange Message Restore add-on license. 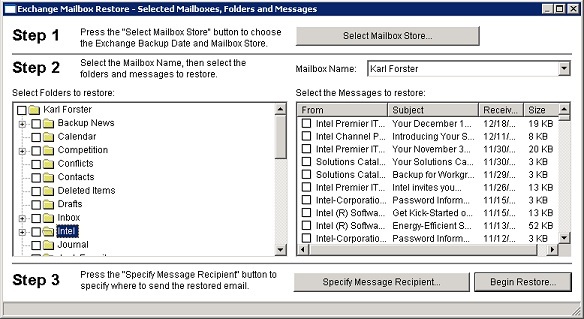 The Exchange Mailbox Restore panel is divided into three (3) areas in which you perform a step in each. In the top portion of this dialog, you perform Step 1. Let's proceed through the 3 Steps on the Exchange Mailbox Restore panel in order. Step 1 - Press the "Select Mailbox Store" button. This is where you are going to select the appropriate Mailbox Store, by backup date, from which you want mail "restored from." You will see a list of mailbox stores that were defined in Exchange Server along with recent backup dates for each store. Select a date before the email was deleted and then select the Exchange Mailbox Store that held that particular message. Private Stores hold email for individual users. The Private store contains the list of individual email accounts and the email messages for those accounts - both inbound and outbound mail. Public Stores hold email that is not associated with any individual and Public Stores hold the data that is shared across your Exchange users. Note - If Outlook was configured to store users' email in LOCAL .PST files, their email MAY NOT exist at the Exchange Private Store; in this case, you need to focus your efforts on restoring the LOCAL .PST on that particular Backup Client. For example, in Outlook, Personal Folders are usually stored LOCALLY, at the Client computer, inside a .PST file. But, email that is stored under your Active Directory Account Name is stored at the Exchange Server. In our example, we want to restore a message from a Private Store that a user deleted from their Outlook email client. They deleted this email message on July 16th, so we are going to use the backup data from July 15th to "pull the email from." Note, we can do this because their Exchange Server is configured to store Private email at the server. The list of backup dates is limited to the number of revisions you have set in the Tools -> Preferences -> Revisions. BFW needs to create a temporary copy of the mailbox store that you have selected. You will need enough free disk space at the Exchange Server to hold the temporary copy of the mailbox store you have selected, so BFW can display it's contents and extract email messages. Once you have selected a location for your temporary working copy of the Exchange data, press the "Create Temporary Exchange Database Now" button. Backup for Workgroups pulls a copy of the mailbox store that you selected from the Backup Server and constructs a temporary, working copy of this mailbox store at the location you had specified above. 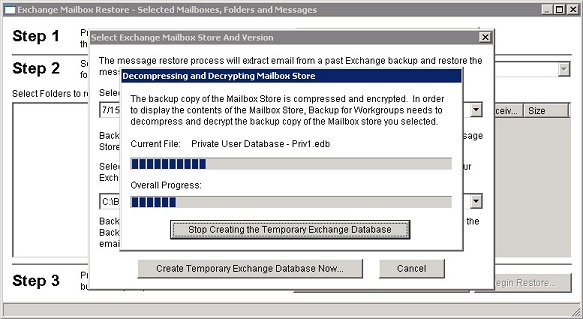 Typically, BFW needs several minutes to construct the temporary working copy of the Exchange mailbox store. The larger the mailbox store, the more time needed, so give this a few minutes to complete. Generally this process will take about 2 minutes per GB of Exchange data. The restore process reads the backup copy of your mailboxes and displays the contents of the user accounts / folders and messages. You can see the Folders on the left, and the messages within the highlighted folder, on the right. 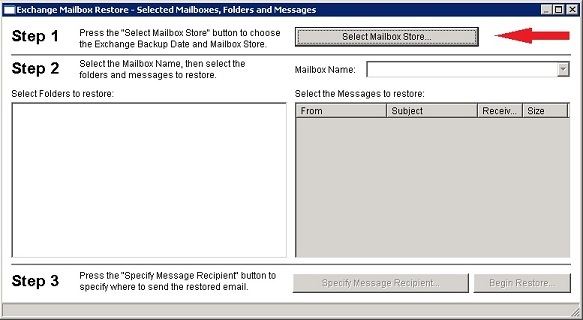 If you choose to restore email from a private message store, the list of Mailbox Accounts is displayed. 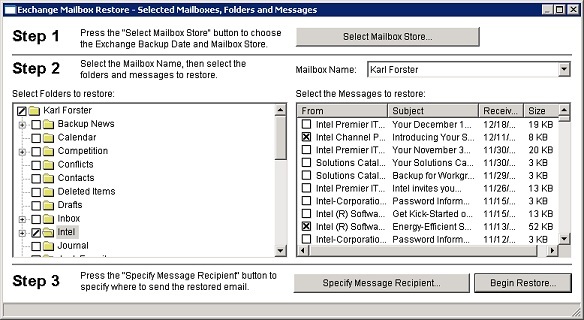 In our example, the Mailbox Name shows us that we are looking at Karl Forster's email. If you want to look at a different email user account, use the drop-list to select another account/user. If you choose to restore email from a public store, the list of public folders is displayed on the left. Since public folders are not associated with accounts, the account name list is not displayed. Use the dialog on the right-hand side to select the messages that you need to restore. In our example below, we are going to restore 2 email messages, as indicated by the checkmarks. Once you have selected the email messages you want to restore, you need to tell Backup for Workgroups where to send the restored email. To do so, press the button labeled "Specify Message Recipient" at the bottom of the screen in the Step 3 section. You will be presented with the Specify Message Recipient dialog. Backup for Workgroups sends the restored email to a user's Inbox. Use the Specify Message Recipient dialog to specify the name of the computer running your Exchange Server. Normally you would send the email to your Exchange Server, but in the event that your Exchange Server is not operating normally, you can send the restored email to another email server that supports the SMTP protocol. 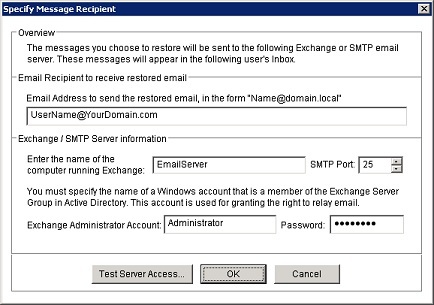 The restored email will be sent to your Exchange Server using SMTP, so you will need to provide login information to your Exchange Server for it to accept the SMTP email. You need to specify an account that has administrative rights or an account that is a member of the Exchange Servers group. If your Exchange Server requires SSL/TLS, you can either use the SSL port which is 465 or set the port to 25 and Backup for Workgroups will switch to SSL/TLS automatically if the Exchange Server states that is what it requires. And finally, specify an account that you want to send the restored email to. This is the address of someone who wants to receive the restored email. Again, the restored email will appear in their Inbox and it will look like new, unread email. After selecting the messages to restore and specifying who to send the restored messages to, you are ready to start the restore process. Press the Begin Restore button. Backup for Workgroups will scan through the message store and find the messages you have selected. Due to the method that Exchange uses to store the messages in the message store, Backup for Workgroups has to linearly scan through the messages to find them. As a result, the time to perform the restore is based on how many messages are stored in the message store. This may take several minutes to find the messages in the message store. Please allow a few minutes for this process to run. When the messages are restored, the progress screen will close. The restored messages should appear in the inbox of the email address that you specified.